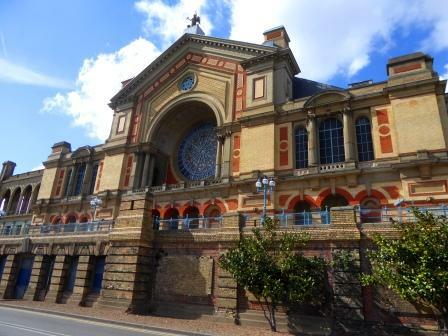 Alexandra Palace. The People’s Palace of North London. It’s a lovely place, even if it has that rather bonkers Victorian/Edwardian nuttiness about it. 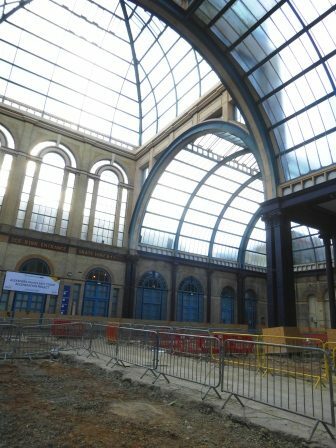 Norf Landan’s version of the Crystal Palace, cursed by witches*, plagued by financial woes and fires (I remember being stood on a table in my classroom at school, watching it burn down). By rights it should have been demolished years ago but we just like it too much so we just keep trying to make a go of it, and this time it actually seems to be working. 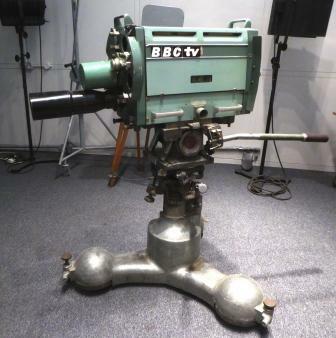 There’s an ice rink and a playground (that I played in as a child), a boating lake, it was the site of the first regular TV broadcasting studio in the UK. There’s a barely-known ‘hidden’ theatre (I saw a highly inventive production of the Odyssey there), crazy golf and, in the grounds below the Palace, a million zillion blackberry bushes (there are some serious blackberrying opportunities at Ally Pally). But today I wasn’t here for all that, but for an Open Doors Construction Tour. I’ve been on these before at a few different building sites, and they’re a great way to get a nosey at some of the most interesting construction projects going on in London**. Craig also managed to bag a ticket at short notice. 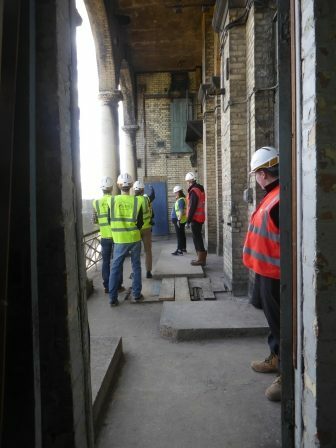 This project is the restoration of the East Wing, where the theatre is situated, and the ongoing works are restoring the structure and decoration improving access, renovation the East Court, building in areas for a new museum of the the early history of television, cafes and function rooms, and generally making it an even better place for visitors. 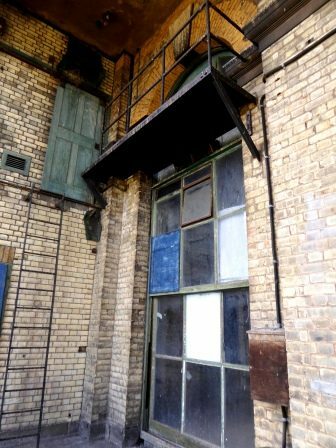 We got to visit some of the area that were used by the BBC as studio, recording and staff spaces. 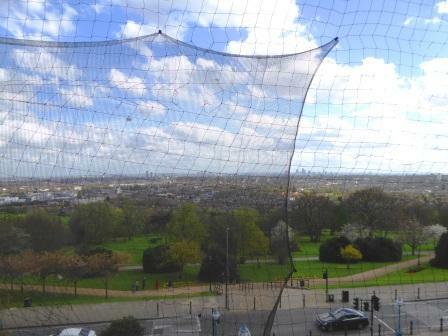 I was delighted to get out onto one of the balconies overlooking the view of London. 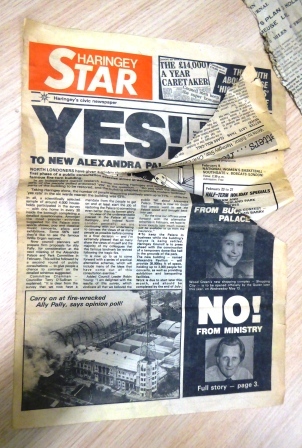 As the works have been ongoing, a number of artefacts have been unearthed and are on show, including a copy of the Haringey Star with the front page highlighting the “yes” vote from locals to the renovation of the recently-burnt Palace. And look, the man from the ministry said “no”. 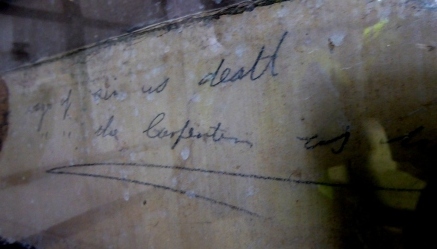 A lot of the documents and images have been scanned by Google so, I guess, they’ll be available online at some point. 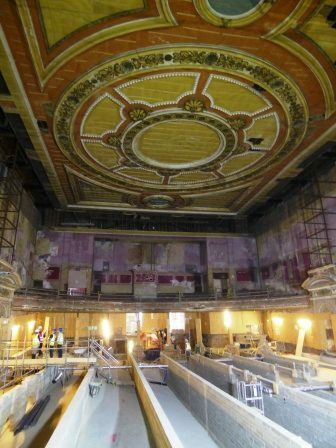 Outside of Islington, North London isn’t exactly flush with theatre spaces, despite its reputation for showbiz lovies, so the renovation of the beautiful theatre at Ally Pally is pretty exciting. We went into the theatre via the backstage passageway and ended up standing on the stage. This is the view out into the auditorium. The raked floor is being levelled up and the stalls area will have flexible seating so that the space can be used for a range of different types of events, including plays and concerts, maybe cabaret and, I’d guess, weddings. This would be a stunning place for a party. There’s something delicious about visiting a place that is really really familiar (I’ve lived within sight of it virtually all my life) and getting to see bits of it that I’ve never seen before, or from angles that I’ve never seen before. ** These open days aren’t only in London. 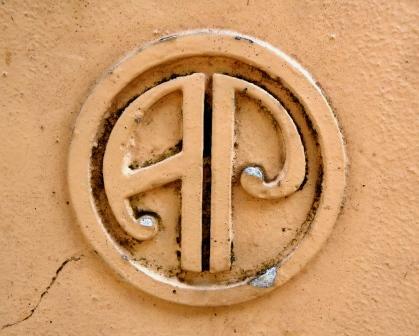 Check out their website to find tours near where you live. 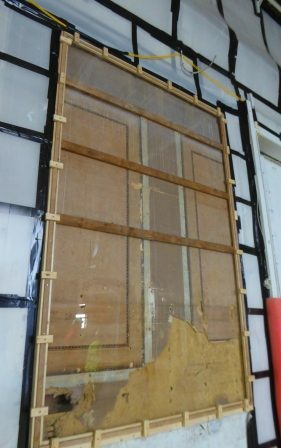 This entry was posted in Archaeology, London, Museums and Exhibitions, Uncategorized and tagged Ally Pally, Archaeology, construction, London, Museum Blogger, Open Doors. Bookmark the permalink. ← Caught by the fuzz.